*Data taken from official Beta Club website on 3/22/2013. Compare us to Beta Club Graduation Cords! Our Honor Cords can be worn by graduating seniors who are members of any club or organization based on their academic achievement (GPA) and their character traits. Other colors of honor cords can also be worn by club members to either show specific achievements, or on a school by school basis. There are many advantages to buying Gold Graduation Cords and Black Graduation Cords at Honors Graduation. We offer superior quality cords at low cost. 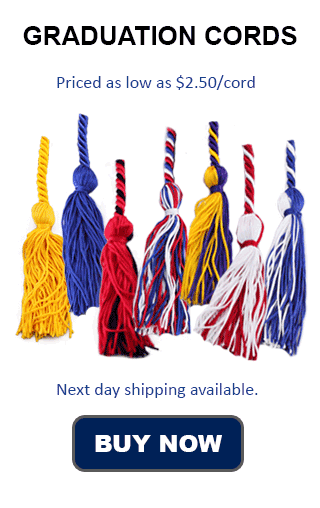 We have no minimum order sizes and have wholesale pricing on our honor cords and graduation products for those who buy in bulk. With Flat Rate Shipping, not only do you only have to pay $4 no matter what your order size is, it will get to you Fast! Honors Graduation is your one stop shop for graduation cords, honor medallions, stoles and tassels. Many clubs and programs exist as honors programs for students in the 5th through 12th grade. Students who participate more in school and school related programs are inspired towards academic excellence, are more engaged, and these organizations are a great way to make friends!